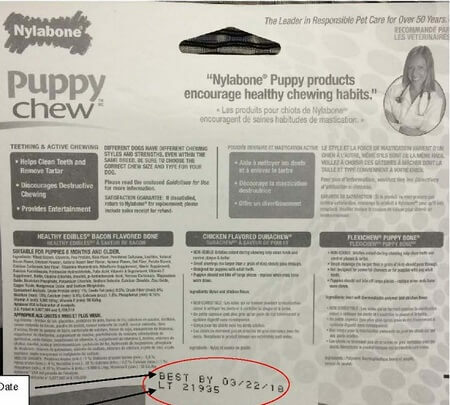 April 22, 2015 — Nylabone Products of Neptune, NJ is recalling one lot of its Puppy Starter Kit dog chews because they have the potential to be contaminated with Salmonella. 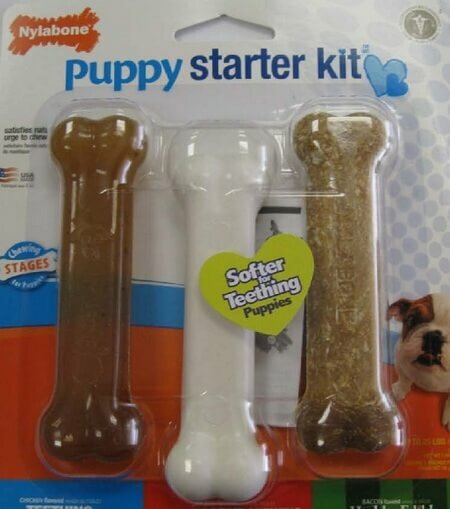 The recalled Puppy Starter Kit consists of one lot of dog chews that were distributed nationwide, to Canada and through one domestic online mail order facility. The recalled product comes in a 1.69 ounce package marked with Lot #21935 and UPC 0-18214-81291-3 and with an expiration date of 3/22/18. The potential for contamination was noted after routine testing by the company revealed the presence of Salmonella. No illnesses have been reported to date in connection with this problem. Salmonella can affect animals ingesting the product and there is risk to humans from handling contaminated products, especially if they have not thoroughly washed their hands after having contact with the products or any surfaces exposed to these products. Rarely, Salmonella can result in more serious ailments, including arterial infections, endocarditis, arthritis, muscle pain, eye irritation and urinary tract symptoms. Pets with Salmonella infections may be lethargic and have diarrhea or bloody diarrhea, fever and vomiting. Some pets will have only decreased appetite, fever and abdominal pain. Infected but otherwise healthy pets can be carriers and infect other animals or humans. If your pet has consumed the recalled product and has these symptoms, please contact your veterinarian. Consumers who have purchased the affected product should discontinue use of the chews and may return the unused portion to the place of purchase for a full refund. Those with questions may contact the company at 855-273-7527, Monday through Friday from 8 am – 5 pm Central time. After hours and weekend calls are covered by a third-party poison control center. Get free dog food recall alerts sent to you by email. Subscribe to The Dog Food Advisor’s recall notification list now.